The Black Cat team were delighted to join the Wenger team at the Frankfurt Musikmesse this April. Black Cat is proud to be Master Distributor for Wenger in Europe and Russia. 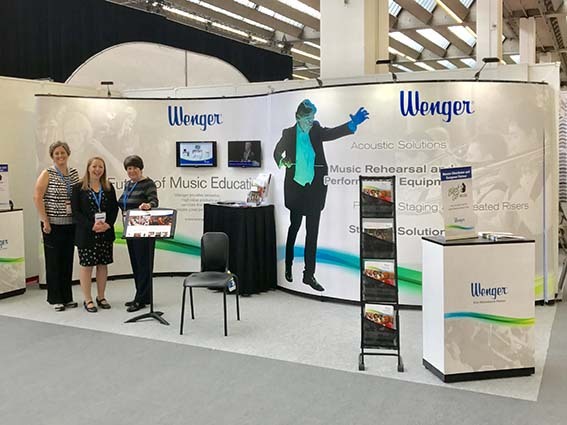 Wenger is world-renowned for the quality and longevity of its music performance products, ranging from music stands and orchestra seating (on display on the Wenger booth) to staging, instrument storage and acoustic solutions. Black Cat Managing Director Alice Dagger reported: "We were pleased to join forces with Wenger at the Musikmesse to speak to customers and distributors across Europe and Russia." Sales Executive Brigitte Downs added: "It is always a pleasure to meet with our customers and we found the exhibition both informative and enjoyable".